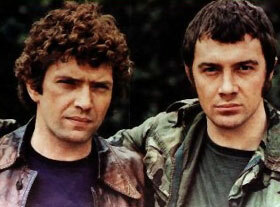 Summary: Bodie is hurt on an op & Doyle realises what's really important. "Ray?" the weak response was all that Bodie managed before slipping back into unconsciousness. It was enough. With a sigh of relief Doyle smoothed a few stray strands of hair from his partner's brow as he continued to rock them both. "I'm here, sunshine, I'm right here." Summary: Doyle receives a letter. I wanted to say that straight away 'cus if you’re reading this then things probably aren't looking too good for me right now. Summary: Bodie's on a 'special' assignment without his partner & Doyle isn't happy. "Och laddie, I know it's not pleasant and if there were any other way...but this is important. We need to know what Stephenson knows and find out if he's up to anything. If he's what he appears to be; a successful, financially independent businessman, then there's no problem. But if our sources are correct then he's involved with some very nasty business indeed - most likely drugs and arms shipments to Uganda. We have to know what he's up to, Bodie - that's why you have to get close to him." At this the cool expression of the dark haired agent broke into a sarcastic grimace, "And just how close would that be, sir?" he said with a hard edge to his voice. "This thing weighs a tonne, mate. I don't know why we bother." Ray Doyle smiled indulgently at the grumbling man struggling to place the six-foot Norwegian Spruce into a brightly decorated bucket. "Because you love it," he replied in a teasing tone. Bodie/Doyle :: PG :: 3263 words :: Dec 1999 :: No spoilers :: Seasonal schmoop! Summary: Back when Bodie was a merc in Angola he met someone who changed his life. "Doesn't look like he's gonna last much longer - there's nothin' I can do for him now." "And another thing - how many times have I told you not to eat biscuits in bed - look at the mess, it's like a disaster area-"
Summary: Doyle's had enough & decides it's time to sort Bodie out once & for all. "No, Bodie! No bloody more! That's enough - I've had it!" Bodie was stunned at his partner's vehemence. "You just don't understand do you, you bloody great twit? Well I've had enough - I'm not putting up with this anymore. It's time you understood how things stand, time I showed you a thing or two I reckon. You're mine, Bodie - bloody mine! And no one's taking you away from me...not some bloody shooter and certainly not you!"